GARNET CROW made their debut with 2 simultaneous releases “Mysterious Eyes” and “Kimino Uchini Tsukumade Zutto Hashitte Yuku” on 3/29/2000. With the members, Nakamura Yuri (vocalist/songwriter), AZUKI nana (keyboardist/lyricist), Hirohito Furui (keyboardist/arranger) and Hitoshi Okamoto (guitarist), GARNET CROW have continued to present high quality sounds and a unique, liberal world of music that they have gained many fans all around the world. They have released 34 singles and 14 albums including best albums so far and their signature hit number is ‘Yume mita Ato de.’ They are also known for their unique and challenging presentation of stages such as their outdoors live held in 2005 at “Osaka Chuo Kokaido,” designated as one of Osaka’s important cultural properties and another outdoors live held in 2007 at “Ninnaji,” a temple in Kyoto designated as a world heritage. Celebrating their 10th year anniversary for their major debut on 3/29/2010, GARNET CROW released their 2nd best album “THE BEST History of GARNET CROW at the crest….” Their single “Over Drive” released in 4/2010 was chosen as the theme song for the movie “Detective Conan: The Lost Ship in the Sky,” which ranked #4 on the Oricon Weekly Chart, marking the best ranking in GARNET CROW’s history. Their new challenges continued on with a symphonic concert with Tokyo City Philharmonic Orchestra and the release of best B-side collection album. 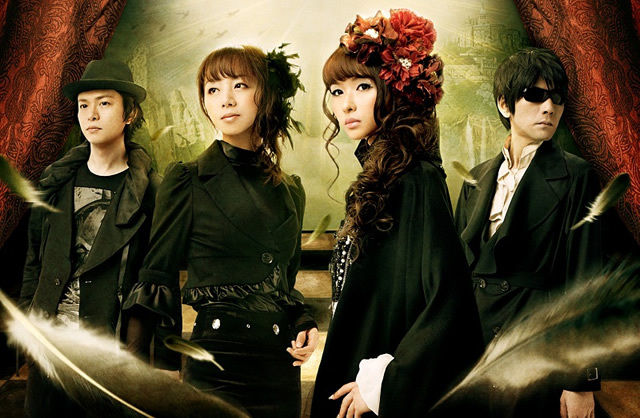 Their commemorative 10th original album “Terminus” was released on 3/20/2013.